Helps you hydrate — Drinking water is an important way to keep your body hydrated. However, eating foods that have high water content can also help. Interestingly, watermelon is 92% water. High water content is one of the reasons that fruits and vegetables help you feel full. The combination of water and fiber means you’re eating a good volume of food without a lot of calories. May Help Prevent Macular Degeneration — Found in several parts of the eye, lycopene helps protect against oxidative damage and inflammation. It may also help prevent age-related macular degeneration (AMD). This is a common eye problem that can cause blindness in older adults. Lycopene’s role as an antioxidant and anti-inflammatory compound may help prevent AMD from developing and getting worse. May help relieve muscle soreness — Citrulline, an amino acid in watermelon, may reduce muscle soreness. Interestingly, watermelon juice appears to enhance the bio-availability of citrulline. Is good for skin and hair – Two vitamins in watermelon — A and C — are important for skin and hair health. Vitamin C helps your body make collagen, a protein that keeps your skin supple and your hair strong. Vitamin A is also important for healthy skin since it helps create and repair skin cells. Without enough vitamin A, your skin can look dry and flaky. Can help improve digestion — Watermelon contains lots of water and a small amount of fiber — both of which are important for healthy digestion. Fiber can provide bulk for your stool, while water helps keep your digestive tract moving efficiently. Eating water-rich and fiber-rich fruits and vegetables, including watermelon, can be very helpful for promoting normal bowel movements. Treats Kidney disorders — Watermelons contain a lot of potassium, which is very helpful in cleaning out the toxic depositions in the kidney. Moreover, they are helpful in reducing the concentration of uric acid in the blood, thereby reducing the chances of kidney damage and the formation of renal calculi. In addition to this, being high in water content, watermelons induce urination, which is again helpful for cleaning the kidneys. 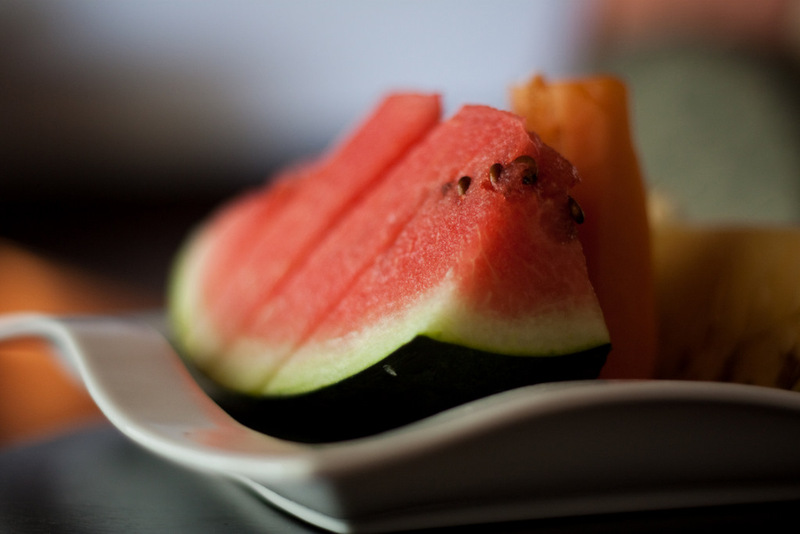 Prevents Heat Stroke — Watermelon is effective in reducing both your body temperature and blood pressure. Many people in tropical regions eat this fruit every day in the afternoon during summer to protect themselves from heat stroke. The high amount of water in watermelons also stimulates a release of excess liquid in the form of sweat, which cools your body further during hot summer days. Regulates Blood pressure — The amount of potassium and magnesium present in watermelons is very beneficial in terms of lowering blood pressure. Potassium is considered a vasodilator, meaning that it releases the tension on blood vessels and arteries, thereby stimulating blood flow and reducing the stress on the cardiovascular system. Controls Diabetes — Diabetics, who are supposed to have a low energy and low sugar diet, often complain about starving since they don’t get to eat their staple diets,which gives them the feeling of being half-fed. Watermelons can be a good supplement for them. In spite of being sweet in taste, a thick wedge will give them very few calories, since ninety-nine percent of its total weight is composed of water and roughage. Moreover, the vitamins and minerals such as potassium and magnesium help in proper functioning of insulin in the body, thus lowering the blood sugar level. Improves Bone health — Vitamin C plays a major role here as the nutrient is good for the bones and aids wound healing. Vitamin A in watermelons has been linked to bone growth. Strengthens Immunity — Watermelon, being rich in vitamin C, strengthens the body’s immune system. The fruit also contains vitamin B6 that helps the immune system produce antibodies. The vitamin also aids in the formation of red blood cells. The fruit has vitamin A that regulates the immune system and protects it from infections. Promotes Healthy Gums — The vitamin C in watermelon keeps the capillaries and gums healthy. The deficiency of vitamin C can cause bleeding gums and gingivitis (inflammation of the gums), and watermelon can prevent these conditions. The vitamin C in watermelon can also kill the bacteria in the mouth that might otherwise lead to gum disease and other gum infections. Boosts energy levels — Watermelon is a good source of vitamin B, which is responsible for energy production in your body. The fruit is low in calories and high in energy, and it can help you stay active for the better part of the day. Intestinal disturbances — As we have seen, most benefits of watermelon can be attributed to lycopene. And the same compound can also cause side effects if the fruit is consumed in excess. Lycopene overdose can cause nausea, vomiting, indigestion, and diarrhea. Hyperkalemia — Excess consumption of watermelon can result in hyperkalemia, a medical condition where the potassium levels are above normal. This can lead to cardiovascular issues like irregular heartbeats and a weak pulse. Allergic Reactions — Certain individuals might develop allergic reactions to watermelons. These can include mild to severe rashes and facial swelling. Now you know what is watermelon good for and why you should include it in your daily diet. Start eating watermelon today, and beat the heat like never before!